My wife's pearly white Sony Ericsson Xperia X8. 1~Gorgeous 3-inch touchscreen. I must say that my Nokia E72 screen cannot be compared to my wife's Xperia X8. The display is really crisp and brilliant if you ask me. So it is an utter joy to be playing Angry Birds RIO and watching youtube on this phone. My wife, baby and I enjoy viewing short clips with the video player. The sound clarity also adds dimensions to our viewing pleasure. Simply awesome! 2~Make It Yours (Via the 4 Corners). Who says this virtually button-less touchscreen Xperia X8 is hard to be navigated? This smartphone allows you to customize the 4 different corners of the homescreen. So maybe you would want to put your messaging on the top left, youtube on the top right? Then for the bottom corners you might wanna house your phonebook and music player? The best part is...you can change them anytime you want. So everything important is within your fingertips with only one single hand. 3~Timescape for Socialist! If you are a self-confessed social creature-that is you can never stop tweeting and stalk your friends and Facebook...then you will be very happy to know Sony Ericson has thrown in this nifty Timescape into this Xperia X8. You see timescape is like a funnel where all your SMS, calls, tweets, twitpics, Facebook updates come together. So it is like your very own all-in-one social app. I really love it! 4~Android-licious Xperia-nce. One of the biggest advantage for owning Xperia X8, is the fact that you are a proud owner of Android. Having the world-renowned Android running under the hood of this Xperia X8 means you will have a lot of features in your grasps! With more than 100,000 applications in the Android Market at your disposal, be sure that you will have a lot of fun time entertaining yourself. I have personally enjoyed quite a number of games downloaded from Android Market for free. It's time to give your Xperia X8 its own unique personality. 5~aGPS inside. With its built-in assisted GPS, you can now get to almost everywhere you want easily. So you will not lose yourself again as long as your Sony Ericsson Xperia X8 is in your hands (or pockets or handbags or whatever place). Guess what? 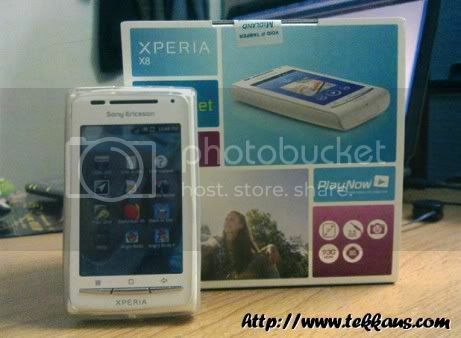 You can even geo-tag the photos that you captured using your Sony Ericsson Xperia X8. So you will know where you snapped that photo of you eating that lollipop. 7~Infinite Button. This is a relatively new feature for me. With a touch of this so-called infinite button, you can get more information about something that interests you. So far I am only able to see this infinite button struts its stuff in the music department. Yupe! While you are listening to...let say Jay Chou's Superman Can't Fly and you hit the infinite button...instantly more tracks of Jay Chou will be listed for you. So that is how this whole "infinity" theory works. Pretty cool if you ask me. 8~Juicy Battery. One of the most important aspect to consider before you get yourself a smartphone is its battery. You smartphone isn't smart if it has a rather premature battery life. In other words you will have to recharge your phone very often after turning on the wifi, tune up the volume, surfing the net etc. I can safely say that Sony Ericsson Xperia X8's battery life is quite long due to the fact that it is powered by a 1450mAh Li-Po battery. Very, very juicy indeed. So there you have it folks-the 8 reasons why you should get this Sony Ericsson Xperia X8. Beside that this smartphone has a 3.2 Megapixel camera which can brilliantly capture all those priceless moments in your lives. Wanna know what else can this little baby here offer you? For starters in has a built-in FM radio with RDS. Apart from that it also comes with a 3.5mm audio jack. This means you can plug in your very own favourite headphone while tuning to your favourite tunes. Are you ready to own an Xperia X8? 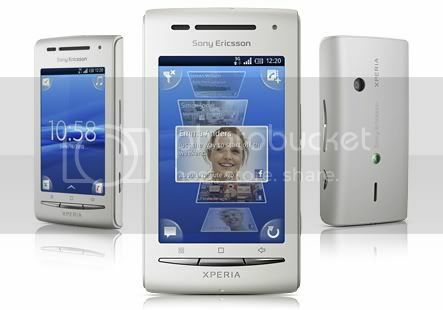 I bought this original Sony Ericsson Xperia X8 as a birthday gift for my wife. It cost me around RM800 including an 8GB microSD memory card. Of course you can swap it with the maximum 16GB microSD if you want to. So for a smartphone with so much features I believe it is reasonably priced. IMHO Xperia X8 is one heck of an all-rounder smartphone. If you are social creature who needs to be connected all the time and yet want to enjoy all the finer things in life...but has a rather limited budget, then Sony Ericsson Xperia X8 is the perfect smartphone for you! My wife is loving this new phone of hers. So what say you?